Springtime has always been my favorite season as it signifies new life and hope for tomorrow. As the days get longer and the earth begins to warm, the once brown grass greens and flowers emerge. The Spring Equinox, which begins March 20th, inspires gardeners to till the earth and plant seeds for a new day. Springtime is also an excellent time to explore new activities – to find innovative ways to help your child flourish. It’s easy to get caught up in the daily grind between jobs, doctor appointments, therapies and school meetings – that’s why it’s so vital to step out of the everyday routine a little and discover. I am reminded of something Temple Grandin said to me recently about parenting children on the spectrum. It’s essential, she said, for families to help children discover an activity they are good at and enjoy and then stretch them so they can grow. It’s important, she said, for children to have the opportunity to learn a skill – whether it’s creating artwork, programming computers or fixing cars. It’s critical to find a talent to embrace as ultimately it will help your child thrive. Fifteen-year-old Chris Furches is an excellent example of someone who has found his niche. Chris discovered his love and natural talent for racing when he was 10 years old. Fast forward five years, and this young man with Asperger syndrome and ADHD who was once slow to speak and experiencing sensory and digestive issues, has become an accomplished ATV motocross racer. Chris is now described as focused, determined and strong and is able to express himself. His story is sure to inspire. Another activity we are excited to share with you is the multiplayer video game known as Minecraft. In his article, “Minecraft Opens a World of Possibilities,” CJ Miyake (Creative Director for PixelAtion Labs) describes the trendy game that can offer children with autism new skills and concepts. First publically released in 2009 (full version in 2011), this game has become extremely popular with people on the spectrum as it is creative, logical and structured. And much to the relief of parents concerned about their children spending too much time playing video games, it promotes social skills and instills confidence. If you are open to adding a pet to your family, you may be interested in reading Lisa Timm’s piece called, “Pets and Social Skills…Making a Connection.” We all have heard about the positive impact animals can have on our families from companionship to unconditional love. Recent reports regarding the value of pets ownership has been expanded to specifically include children on the spectrum. In the right situation, a dog, cat, hamster, bunny, etc. can possibly help improve social skills as well as help with sensory tactile issues. We have been delighted with the positive response from our readership in recent months and appreciate the people who have reached out with questions regarding autism. We recently received a question from a mother who had serious concerns about how to handle her child who has been biting. Board Certified Behavior Analyst Angelina M. provides a comprehensive answer to include the four main reasons a child bites as well as ways to help stop the behavior. We also received an email from a father of a young man with ASD, anxiety disorder and learning difficulties, who wanted a better understanding of neurofeedback. Be sure to check out an informative response provided by Desaree Festa, PhD of Southeast Psych. And in an effort to keep our families well-versed, we have included an article written by Occupational Therapist Bill Wong on FERPA, which stands for Family Educational Rights and Privacy Act. He explains why young adults on the spectrum need to be aware of this federal law that protects privacy of student records. 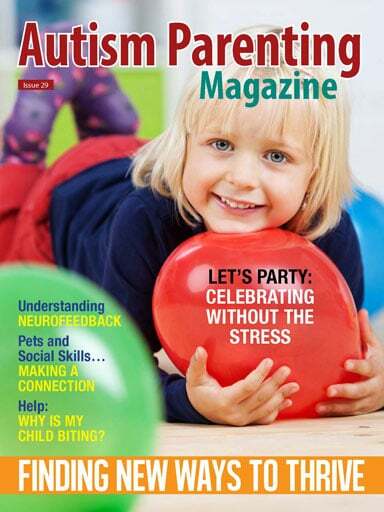 On a lighter note, we are also thrilled to share with you excellent party ideas in “Let’s Party: Celebrating without the Stress.” Written by the mom of seven children, Lisa Fish Smith, the article provides advice for planning a party while taking in consideration different sensory needs. Wishing you a happy Spring full of hope and new beginnings!